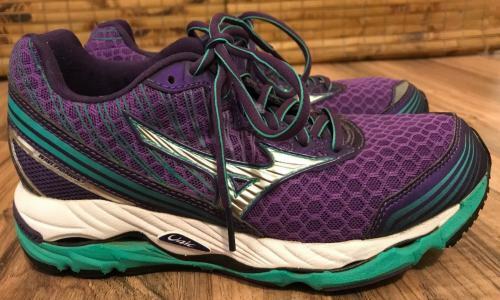 14 Best Running Shoes For Flat Feet & Overpronation - 2019 Reviews! →Best Running Shoes For Flat Feet – 2018 Ultimate Review Guide! Best Running Shoes For Flat Feet – 2018 Ultimate Review Guide! Flat feet are one of the nightmares for people who love running. But the good news is runners with flat feet can still be very successful runners. From now on, you have to pay close attention to your running shoes and training. 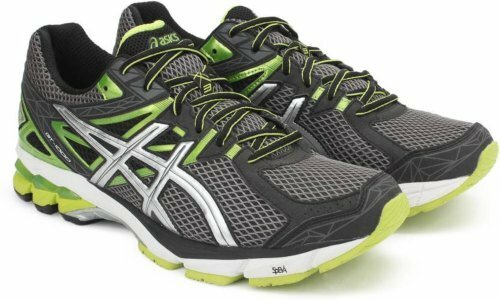 Below are 16 best running shoes for flat feet reviewed. What kind of shoes does a runner with flat feet need? In short, the keywords to remember are: stability, support and motion control. A stability shoe is for someone that has what’s considered overpronation caused by flat feet. Overpronation needs to be controlled because it could lead to foot injuries like plantar fasciitis, bad knees, and hip and lower back pain. A motion control shoe is for someone who has severe overpronation problems and needs a lot of motion control on their foot. What you should know about the Brooks Beast 14 is that it’s made for the moderate to severe overpronator and offers so much support and so much cushioning and stability for flat feet runners. So you’re looking at one of the best men’s running shoes for flat feet. It’s also recommended for people with other foot problems like Plantar Fasciitis. Unlike most other shoes, the Beast 14 is nice and straight through the arch. This provides a lot more midfoot support especially if you have more of a flatter sort of foot or you feel you need more support in your everyday exercise, walking or running. It features breathable mesh throughout with synthetic overlays which snug it up. It has a ton of cushioning around the collar and tongue. The footbed is removable and helps with long runs. The midsole is what’s going to keep you running straight. It features the Progress Diagonal Rollbar which helps keep your foot supported and right where it needs to be. The saddle through the midfoot of the Beast allows the foot to be locked into the shoe, and this allows for people with flat feet who usually experience depth issues within the midfoot of the shoe to find a much tighter knit with the shoe’s extra saddle that Brooks have created through the midfoot. The Brooks Beast has Full-length DNA which allows adaptive cushioning to control the runner’s foot making it a much softer feel under the foot. The bottom features rubber and flex grooves, which makes the Beast 14 really great for wet and dry surfaces. There’s even gel cushioning which adds to the overall efficiency of the shoe. So whether you’re heavier or lighter on your shoes, the Beast will provide the cushioning that you need for your run. They don’t call it the beast just for no reason at all. The Asics Gel Kayano 22 is a high-end cushioned stability shoe great for that mild to moderate overpronator. This being a stability shoe, it keeps the foot from rolling to the inside. It also features three internal bands that kind of wrap around the foot, and that’s both on the lateral and the medial side. So with the internal bands on the medial and lateral side holding the foot in place as well the improved heel clutch system, the 22 is a great option for flat feet runners. To top it off, Asics Gel Kayano 22 has the Engineered Mesh Layer on top to complete the FluidFit for a completely free-seam fit on the upper. It features a Stretch Mesh Layer underneath, which provides an irritation-free fit. Also, Asics have moved the heel in and up and extended it to give you that great heel fit. What did Asics do in the midsole? Well not much from the 21. They kept that same great FluidRide 2.0 with that 20% bounceback feel and that 15% lighter bottom layer. So the Kayano 22 provides that same great ride that you had before with great gel on the lateral side keeping you cushioned from heel all the way to the forefoot toe off. The outsole is super cushiony and provides great bounceback. I’ve tried a lot of shoes that are really cushiony but don’t fight back a little bit and I don’t like that. The Kayano 22 has a really soft inside sockliner which is great and feels nice on your feet. These shoes dry faster and hold less water if you happen to run in the rain. Other than that, the Kayano 22 is pretty much the same thing as the 21 and that’s not a bad thing. 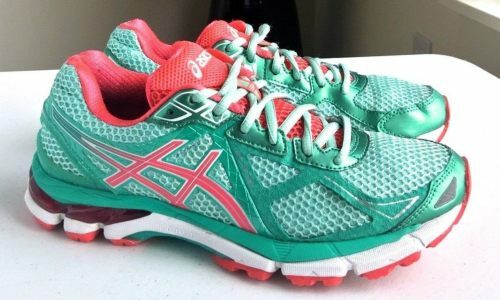 They do fit one half size small, which is standard with most Asics. Runners who have tried the two shoes do prefer the 22 because its upper is lighter, more breathable, more flexible and just feels better on the foot as you have less overall material holding you down. The Nike Lunarglide 6 are actually the best Nike shoes for flat feet. It is quite unique in the fact that it is a really soft cushioned supportive shoe, which is not typically found in a stability shoe. It’s for someone who wants to run in it every day wherever it is that their runs may take them. The idea was to create the most cushioned and supportive shoe without being gigantic like most stability shoes. The new lightweight cushion material Nike have used in the Glide 6 update is going to bring a lightweight feel while still being very plush. So the Glide 6 is lightweight and responsive and is 30% lighter than before. For a more supportive ride, Nike is using angled dual-density midsole foam. This will slow down pronation earlier providing more stability than previous models. The extra support is coming from Asics firm Phylon on the medial side that tapers into 100% Lunarlon cushioning in the forefoot, which helps smooth out the transition and pronation. 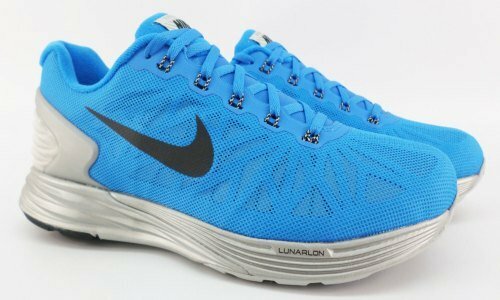 Lunarlon is Nike’s softest, most cushioned and lightest foam compound. Another major update to the Glide 6 is the redesigned outsole. By running over a pressure plate, Nike’s athletes helped design the Pressure-Mapped Outsole. The Outsole features a kind of concentric rings that work like a piston and are able to move up and down independently from each other. Not only will this allow the shoe to flex well, but it’ll also allow for it to flex independently, giving you a smooth natural stride. Also, the grooves around them allow them to flex in a way that fallows that natural foot stride motion of the foot. Another great update is the seamless Flyknit upper which uses a dynamic fit to give a lockdown snug fit, stability and support. Nike has coupled the upper with dynamic fit using Flywire cables giving you support and structure where you want it. Also, the supportive heel clip will continue to give this shoe a lockdown secure feel. Whether you intend to use it as your everyday shoes or as your tempo or workout shoes, the Lunarglide 6 will certainly enhance that plush soft ride and provide more response to the overall ride and feel of your foot. That sounds like the best of both worlds really, cushioning, support, you got it all in one package. For the 11th edition, the Wave Inspire has been distilled down to the essentials of a great support shoe, putting less between the runner and an epic run. With a 12mm heel drop, this standard daily running shoe is designed for moderate overpronators looking for a smooth ride with a blend of support, cushioning, more stability and more comfort. So it is a moderate support shoe which is going to fit an individual who has medium to lower more flexible arch, i.e, flat feet. The Wave Inspire 11 achieves a high degree of support by using a double fan wave in the heel, a supportive upper fit that hugs the midfoot perfectly and a low toe spring that gives the runner a stable forefoot base. Lightweight U4ic technology provides optimal shock absorption and works with the supportive Wave Fan to guide the foot through the gait cycle. When you combine all these elements you end up with a smooth harmonious run that also guides the foot efficiently throughout the gait cycle. With goals of increasing comfort, Mizuno introduced the revamped two-piece upper made of soft pliable mesh which creates a more ideal foot wrap while still maintaining Mizuno’s classic fit. The outsole strategically employs X10 in high-wear areas and a lighter material in the forefoot for a tremendous underfoot feeling and ideal toe off, while the Barely-There Upper Pattern frames the foot perfectly with minimal uses of overlays. Weighing in at 9.5oz, the Wave is perfectly suited to deliver a smooth ride while also achieving an ideal level of support. Thoughtfully designed and refined down to the essentials, The Inspire 11 delivers what runners need in terms of ride, runnability and an ideal level support to keep them going faster and farther with every run. This is the first time the GT 1000 series has ever featured IGS, or Impact Guidance System. 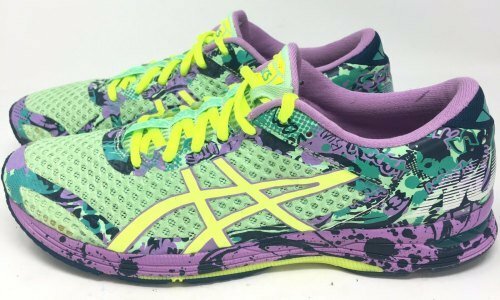 This basically means that the GT 1000 3 meets all of Asics’ really rigorous testing and performance standards. So it’s going to be right up there in Asics’ echelon of higher performance running shoes. The GTS system works in conjunction with the Guidance Line Technology to slow pronation for a very natural stride and gait. It still features the Duomax Support System which makes it perfect for mild to moderate overpronators and the SpEVA Midsole which is really bouncy and fun, making the shoe a great option for a variety of runners. It provides great midfoot support with the stabilizing Trusstic System and gel cushioning system in the heel and forefoot to help absorb shock and offer a smooth transition as you are running. It features a new breathable upper construction that has lightweight seamless welds throughout the quarter panel. These awesome shoes are constructed with Gore-Tex Technology to help give you a wonderful water-proof experience. It has a traditional lace-up system with a very soft padded lining on the inside and a removable footbed to give you some added cushioning with every single step you take. With a 12mm heel/toe offset, the GTS 16 is a standard daily trainer designed for moderate to severe overpronators who require a combination of cushioning and great support and stability. Continuing the use of the BioMogo DNA midsole as well as the Progressive Diagonal Rollbar (PDRB), this daily trainer has a gender-friendly cushioning design making for a dynamic, cushioned ride yet supportive ride. In the midsole we see a small improvement with the use of deeper V-Grooves for a smooth transition as well as a more plush underfoot feel. The midsole is designed to promote progressive pronation control as well as smoother transition through the gait cycle. Along with an updated No-sew upper, the Adrenaline provides an optimal wrap with plenty of breathability. This shoe is breathable, and its moisture managing element mesh and synthetic upper protects the feet from various elements. By the way, GTS stands for Go To Shoe and this sure to be yours. This is one of Asics’ best-selling running shoes and the lightest version of the Asics GT-2000 series in over its 20-year history. It’s a really versatile all-round running shoe that still provides really great cushioning and really great stability. If you’re a mild to moderate overpronating runner, the Asics‘ Duomax technology is something that will provide you with enough support to really help control your stride. In this update, we see the addition of the new and improved FluidFit midsole to help reduce weight and increase bounceback by 20% from foot strike to toe off. This great two-layer construction also allows the shoe to have Dynamic Duomax which provides really great but comfortable and lightweight stability for the mild to overpronator. The breathable mesh upper features a brand new external Heel Clutching System that utilizes an Exoskeletal Heel Counter to improve support and create a snug heel fitting environment. This is specific to mild to moderate overpronators as it provides more stability on the medial side of the shoe. But what’s great about it is that it has seamless materials to reduce the potential for irritation caused by stitches and seams and help create a more glove-like feel. It has very soft padded and breathable lining on the inside with a removable footbed giving you a ton of added cushion. It also features Impact Guidance Line Technology (IGS) that’ll help enhance the foot’s natural gait from heel strike to toe off. The bottom has an extremely durable outsole made out of Asics’ High Abrasion Rubber (AHAR) to give you a great durability in the high-wear areas of the outsole. It’s also incredibly flexible and features rearfoot and forefoot gel cushioning for added comfort. You can use it for shorter distance training and take all the way to your longer distance marathon running. The GT 20003 is also great for someone who’s just getting started and wanting a super comfortable stable shoe for everyday training. Witt a 20-year life cycle of the 2000 series, the GT 2000 3 becomes the lightest version weighing in at 10.7oz for men and 8.4oz for women. 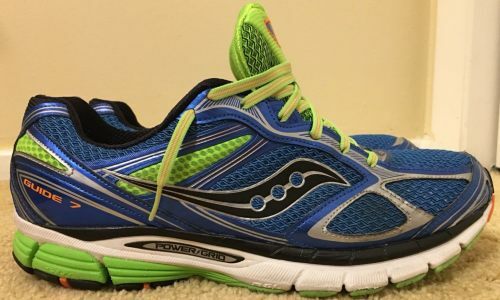 This is a shoe that is engineered to enhance the experience of the runner, and that runner would be the runner who has a degree of mild to moderate overpronation. It has a dual-density midsole that is key to manage the degree of pronation the runner experiences. Saucony have integrated a Dynamic Fit system with properly placed overlays, medial support to keep the foot stable. Saucony really took their time in putting the 7th version of the Guide series on the market. The result is a really great running shoe. The Guide 6 was super popular for its lightweight support and cushion and the 8mm offset geometry. The Guide 7 is still an 8mm offset shoe, meaning that the heel is 8mm higher than the forefoot. So it’s right in that sweet spot in between minimal and traditional shoes. It’s all about 1.5oz lighter than the Guide 6, so it’s very lightweight. The biggest upgrade on this shoe by far is the switch from the lightweight ProGrid midsole to a sturdier full-length PowerGrid version for better cushioning and more responsiveness. PowerGrid is a piece that is 15% lighter and 30% more resilient than the ProGrid. It is also used in Saucony’s premium high-end shoes as well. The result is more support and comfort underfoot, which in turn should mean more miles on the road. Saucony have engineered the medial aspect of the shoe with some stability zones. These zones give additional surface area so the athlete can remain centered and balanced as they’re going through the gait cycle. It features an SRC crashpad that has been decoupled in order to handle the first phase of the impact on heel strike, so it actually helps to maximize the shock absorption and to place the runner in a more balanced position going forward. The flex grooves of the outsole have been enhanced. They’re notched a little bit deeper to make sure the shoe is very smooth on transition. The flex grooves have been enhanced on the bottom of this shoe as well. They’re notched a little bit deeper and they radiate out from the ball of the foot, which makes for a really natural smooth transition when your foot hits the ground and you start to roll forward. The sole on the forefoot is also noticeably flared out so it offers a fully-centered, stable and balanced platform as the athlete is transitioning from heel strike and moving forward to toe off. Almost everybody can run in the Guide 7. Overpronators will appreciate the light stability and guidance, while neutral runners will find it offers a touch of support without overcorrecting their foot through the gait cycle. With a 12mm heel to toe drop, the Wave Paradox 2 is a premium daily running shoe designed for runners with moderate to severe overpronation. Designed for runners who want support without the weight, the Wave Paradox 2 promises the support of a maximum stability shoe without all the weight associated with them. The newest edition of the Paradox series sees some small updates to the insole and upper to help improve ride while reducing weight. The lighter mesh upper is also utilized with a PU printed design that wraps around the heel and midfoot for a lightweight yet structural wrap. It is constructed with security and flexibility in mind by using the design of the shoe to help hold and support the foot in the places you need most. The Paradox 2 features a Double Fan Wave U4ric midsole in the heel for maximum shock attenuation at heel strike and a higher degree of underfoot support throughout the gait cycle. It has a wider platform that provides a sure footed base for added stability while flex grooves in the forefoot increase freedom of movement. The Wave Paradox 2 breaks category norms providing maximum support and cushion without sacrificing the flexibility and the lightweight fluid ride. Supportive and light, a true Paradox. The Foundation 12 is in the motion control category. 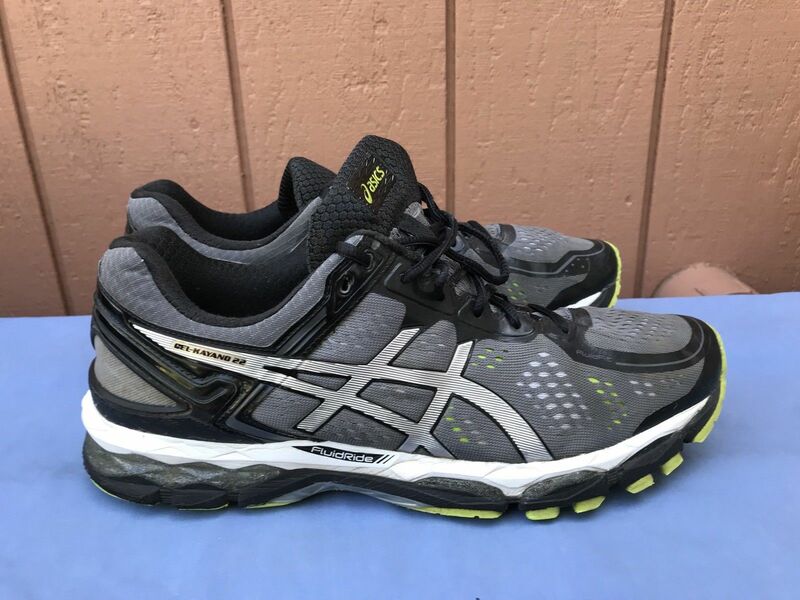 It is the successor to the Asics Gel Foundation 11 built for the moderate to severe overpronator who requires reinforced cushioning and a really supportive steady ride. You’ll get the stability you need to improve overpronation without adding extra weight thanks to the Dynamic Duomax Support System and Guidance Trusstic System that integrates the Guidance Line to increase gait efficiency. The Gel Foundation offers a brand new upper that better accommodates orthotics for runners who need them. The breathable mesh upper features textile film for expanded durability and a lace-up system to lock your feet in. The Gel Foundation 12 also has a breathable fabric lining on the inside with an ultra-cushioned Comfordry sockliner to give you a cooler, drier and healthier environment for your foot. It has a SpEVA midsole that’ll give you excellent energy return with every single stride with rearfoot and forefoot gel cushioning systems for a great shock absorption. This shoe also has a DuraSponge outsole that’s going to give you long lasting wear and amazing flexibility. This is Saucony’s core stability trainer and it’s built for that runner who needs that combination of enhanced support, stability, and cushioning as it offers Archlock for a nice medial support. 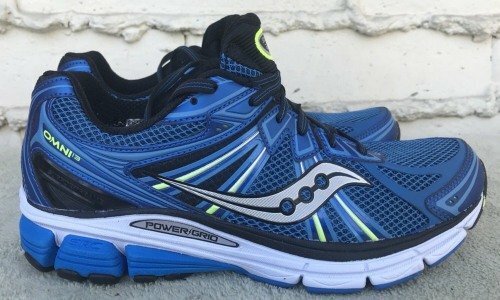 How did Saucony enhance the support in this shoe? Well, one of the key things Saucony did is they lined the platform a little bit so you get a little bit wider basis support. They have enhanced the stability of the midsection of the midsole by incorporating a little bit of a bridge pattern with the stability zone of the shoe again enhancing the overall stability, comfort, cushion, and the overall performance as you start to overpronate. They also made sure the Omni 13 features a support frame around the heel combined with the Full-length Power Grid so that your foot stays centered on the straight and narrow. The upper is constructed on a very breathable lightweight mesh with welded heat-fused overlays to eliminate stitching lines to enhance the internal comfort of the shoe. The overlays are really going to snug it up on your feet right where you need it with no places for irritation as you’re toeing off. The midsole is stiffer on the medial side for support while the rest of it is really nicely cushioned. The outsole has a combination of durable carbon rubber and blown rubber which is lighter and helps keep the weight of the shoe down and perform. It has nice flex grooves all throughout giving you great flexibility that you need. From a weight perspective, the Omni 13 stays consistent with the Omni 12. The first thing you’ll notice about the shoe is simply that you will get noticed. The Noosa Tri 11 is one of the best women’s running shoes for flat feet. It’s a stability shoe and great for overpronation problems. It’s specifically constructed to fulfill the needs of triathletes. One of the many nice things about this shoe is that it’s designed to take elastic laces and comes with its own elastic laces that are pretty easy to fit. It has a seamless construction which helps reduce the likelihood of irritation while you’re wearing it and a breathable mesh upper with feather light synthetic overlays on top of that. It features plenty padding on the inside with a soft perforated fabric sockliner on the bottom to give you enhanced breathability and excellent moisture drainage. The tongue has stitched in loops and you can put your elastic laces through those loops. So when you put your foot in, the tongue will not slide all the way down through the shoe, a really clever little addition to the shoe. It features IGS system in there to help the foot through its natural gait cycle and give you a really comfortable heel strike all the way to toe off. You also have EVA properties in the midsole which is made of so light and shock absorbing material. There’s also rearfoot and forefoot gel cushioning systems. The Noosa features what Asics call a Wet Grip Outsole which is basically a road sole, pretty flat and smooth and it’s designed to keep you nice and steady on wet or dry surfaces. And of course you have that Guidance Line Technology on the bottom to give great vertical flex and help give your foot maximum stride efficiency. It’s not a trail shoe, but it has a reasonable amount of grip within the actual pattern. The footbed is removable if you want to replace that with your own orthotic. 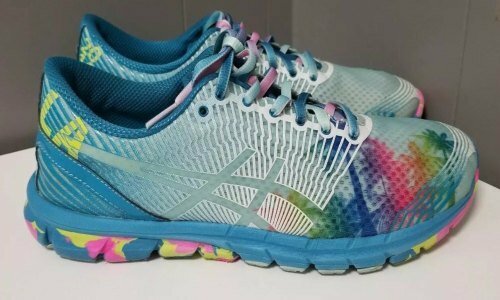 If you’re a fan of Asics’ Gel technology, you will fall in love with the Noosa. This shoe has been designed to be worn with no socks on, but obviously if you wear socks that’s no problem. It has a glow in the dark property throughout to help give you great low light visibility. You’ll have the most comfortable feet in town when you are running all around with these awesome shoes. It features a new Flyknit upper and Fly mesh (check) on the upper. If you prefer shoes with less cushion, the Lunarglide 7 is surprisingly lightweight for its frame. 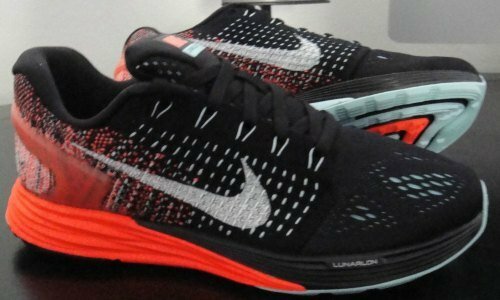 The Lunarlon outsole doesn’t feel clunky or slow. The cushioning is pleasantly soft and does not interfere with the foot’s strike or stride during faster pace runs. The new Flyknit and Flymesh upper feels both durable and breathable and the tongue is noticeably plush. As a stability shoe, the Lunarglide 7 continues to support runners with mild overpronation. The 10mm heel to toe drop and the Pressure-Mapped Outsole keeps the Lunarglide from feeling too bulky underfoot. I thing it works best as a daily trainer on the road. The Lunarglide 7 stands out from other running shoes because of the noticeably soft cushioning, the updated Flyknit and Flymesh upper, and by continuing to provide support for overpronation. The upper is extremely comfortable because of the plush design and you’ll feel confident adding daily miles on the shoe without worrying about blisters or chafing. Fly wire cables are present around the laces to provide a secure fit, and the deep grooves cut into the outsole allowing this shoe to stay flexible and responsive. 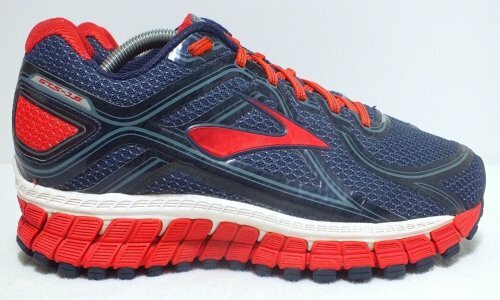 Overall, I think that this shoe would benefit runners who prefer a noticeably softer ride without adding an extra weight. The Lyte 33 2 is a stripped-down and lightweight performance trainer designed for the neutral runner. In this update, this running shoe receives a top-down redesign. A brand new upper features a seamless internal sleeve for increased comfort around the midfoot and forefoot. Underfoot, a two-layer SpEVA midsole offers a bouncy and responsive ride. Underneath, a FluidAxis flex groove in the heel gives the shoe a more efficient and smoother heel to toe transition. Shoes similar to the Gel-Lyte33 2 are the Pearl Izumi EM Road N1and the Saucony Kinvara 7. Compared to these two shoes, the Gel Lyte offers a slightly softer underfoot feel as well as a bit more cushioning for daily training and higher mileage. Testers found the Lyte to offer a soft and resilient ride. This shoe feels especially responsive in the forefoot and favors a mid to forefoot landing. It offers a lighter underfoot feel which is great for fast running and racing while retaining enough cushioning for daily training. The upper is roomier and less constricting than the previous version fitting a variety of foot shapes with ease. Those with narrow feet will still be able to obtain a sung and secure fit by cinching hard on laces. The Gel-Lyte33 2 is a great option for the runner seeking exceptional value and a lightweight and fast feeling shoe. Strong arches are important to your body’s health. Having flat feet or “fallen arches” can cause pain throughout your feet, ankles and lower leg muscles, especially near the arch and heel. With a fallen arch, your foot will tend to roll inward or overpronate, and the entire sole of your foot will come close to touching the ground. What other symptoms can runners with flat feet experience? Your feet feel painful or achy, especially in the areas of the arches and heels. The inside bottom of your foot becomes swollen. Foot movement such as standing on your toes is difficult. You may have pain in the lower back, hip, knee, and leg. Overtime, flat feet can lead to more serious problems in your body’s alignment and may cause the angle of the joints in your hips, knees and ankles to change slightly putting strain on those joints. Heel spurs or sever heel pain when you first stand up or walk after a period of rest. This is called Plantar Fasciitis. Lower back and hip pain from not absorbing foot shock properly. Ankle and knee pain from misaligned joints. Arthritis which may develop overtime in the rearfoot joints. Foot injuries, ankle sprain, or broken bones in your feet. Failing to treat a foot injury without a proper heeling time or arch support. Weakened muscles in the foot, ankles, and lower leg from aging or weight gain. Standing or walking for longer periods of time especially in heels or dress shoes. Wearing uncomfortable shoes without proper arch support. Or it could be hereditary. People with flat feet need a little bit more supportive shoes than somebody with normal arched feet. Manufactures always claim that their running shoes are well supportive and they have special things built into the shoe to make it more supportive for people with flat feet. The problem is that very few of these shoes actually qualify as being supportive on the inside of the shoe. So you have to take into consideration the construction of the shoe and how it’s going to support the foot. A person with a flat foot needs a stiff soled supportive shoe in order to keep the foot from over-rotating into the flat position. There are several components that one can use to evaluate a shoe and make sure that it’s supportive enough for a flat foot. The first thing you need to check is whether or not the shoe will bend in the proper place. A shoe that bends straight in the middle where the arch is is not a good shoe because it won’t provide enough support for somebody with a flat foot. You need to test the shoe by bending it, and if it bends where the toes are supposed to bend, then that means the shoe is supportive enough. The second thing to look into is how well you can twist or torque it. If you can twist or torque the shoe almost like you’re wringing a towel as many canvas style shoes will often do, then that means that the shoe really does not have a lot of support from one side to the other and isn’t going to be good for flat feet. The final consideration you need to make is how stiff the heel is. A good stiff heel counter will help to resist the rotation of the heel bone as it often does when it flattens out. Try pushing on the back of the shoe, if it’s barely stiff and doesn’t want to yield, then that means you’ve got a good supportive shoe. However, if you can push the heel counter with your thumb all the way down, that means it’s fairly flexible and not such a good construction for a person with flat feet. This pretty much wraps up my “best running shoes for flat feet” post. If you have some questions about any running shoe in the list above, make sure you leave a comment below.